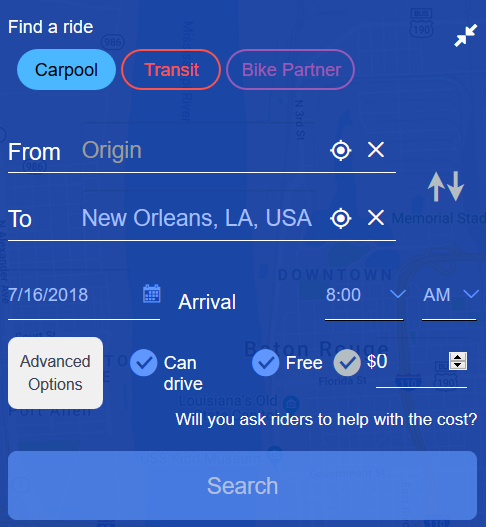 commuteSMARTseacoast | How Do I Offer A Ride? How Do I Offer A Ride? First – visit the 'Find a Ride' widget. Start typing in your destination. As you do so, suggested matches for your destination will be displayed below. Keep typing… when you see your destination, just select it. Then touch the arrow icon to proceed to the next step. Now the widget will expand to ask your origin and desired date and time of arrival. Select your 'from' location the same way as you did your 'to' location – just start typing and pick from the list. As you select your destination, you’ll see your route mapped out. Select your desired date and time of arrival. If you can drive, check the 'can drive' checkbox, and indicate whether you would want others to help with the cost if you are the driver. If you can't drive, that's OK. You can still search for others who can drive on a trip similar to yours. Next, click 'Search', and matches for your ride request will be displayed below. In the widget, if you have 'Carpool' selected, and if you did not select 'can drive', then the matches will be of persons who are driving and willing to give someone a ride. If you did select 'can drive', then your matches will include other drivers as well as riders. If you match to another driver, it's up to the two of you to decide who will actually drive. If you are not yet logged in, or you do not have a profile, you will see a list of possible carpool matches without contact information. If you are logged into your profile, you will see the same list, but with the ability to contact each person. Just click the 'request' button. In either case, you can click on the person's line in the list, and the map will show you where their trip goes. For each item in the list, you will see info about each driver's trip. If the other person is asking you to contribute towards the cost of driving, you'll see the amount requested. Note that our web site does not collect any money or charge a fee. Any payment between you and the driver is an arrangement strictly between the two of you. If you would like to ask one of the people on your list to carpool, touch the 'request' button. If you confirm, an email message will be sent to that person, notifying that a person has asked to carpool. When they log in, they will see that you have asked to carpool, and they can confirm or reject the request. If the other person confirms, you will receive an email telling you so, with that person’s contact info. At that point, the two of you should contact each other and work out any remaining details. In the event that a carpool ride is not available, please check for public transit to get you to your destination. Once you have selected your destination, origin, date and time, select 'Transit' in the widget. Then click Search. Transit results for your trip will be displayed below. For each, you may expand the result to see step by step details for each transit trip plan.